Admit it – you sang that line in either your sweetest Sandy voice or in your swooniest Danny voice! (that’s a Grease reference, for those of you not showing your age). Now that the temperatures are finally starting to rise (it seems like the warmer weather is a bit later than usual this year) it’s time to think about summer, and in particular, plumbing options that can elevate your summer to awesome. Outdoor kitchens are the ultimate in alfresco entertaining at home – they really do turn your outside living spaces into an entertainer’s dream. They expand your living space, keep cooking smells outside and increase the value of your home. Add in a small sink and fridge and your outdoor kitchen is even more convenient. In such a relaxed outdoor setting, with outdoor lounge and dining sets, nobody gets stuck inside cooking, making outdoor entertaining a much less stressful experience for both small gatherings and big parties. If you’ve got the space, it’s definitely something to consider. If your budget doesn’t allow for a full outdoor kitchen but you still want to make the most of your balcony, deck or outdoor area, consider having your BBQ connected to a gas main supply. You’ll never run the risk of gas bottles running out with half-cooked snags again (now there’s an incentive!). No more desperate trips to the servo for swap ‘n’ go gas bottles – just a continuous source of gas straight to your BBQ. Whether you have an existing bayonet connection or not, these can be installed. This is the ideal time to point out that, for your own safety and current regulations, you should always be using a licensed gas fitter when dealing with gas pipe fittings. Attempting any type of DIY is illegal and can result in a dangerous gas leak. It’s imperative that you call a licensed tradesman if you have any issues with gas. 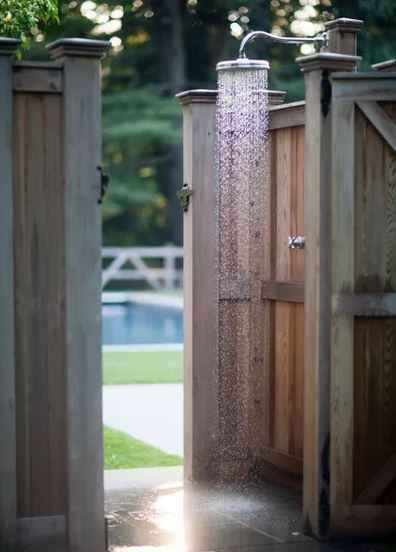 Outdoor showers are not just for beach houses. There are a number of great reasons to install an outdoor shower at your place – whether you live close to the coast or inland. They’re great to add to a pool area, so no more dripping water through the house to get to the indoor bathroom. You can keep your home clean by using the outdoor shower for kids and dogs, for post-gardening, after a run, and as a great extra shower when you have house guests. And of course, they’re a must if you live near the beach (unless you like having sand trampled through your house …). From a design perspective, outdoor showers also give your house a resort-feel and are sure to add to the value of your home. For the next few months, the temperatures are only going up, so give some thought to your outdoor areas and give the Bear team a call when you’re ready to embrace some of these ideas.